The Town of Hebron through the Economic Development Commission agreed to participate in the First Impressions community exchange program organized by the University of Connecticut in partnership with the Connecticut Main Street Center . This program was designed to help communities learn about their strengths and shortcomings through the eyes of first-time visitors. First Impressions is a structured community assessment that offers a fresh perspective on the appearance, services and infrastructure of each community. Volunteer teams undertake unannounced visits, record observations, and give constructive feedback to the exchange community. In 2018, EDC members, Town officials and Hebron business owners participated in the event. Hebron was paired with Durham, CT. The team from each town visited the other town unannounced and recorded their “first impressions”. Afterwords the two teams met and exchanged their experiences. This was a great way to discover how Hebron looks to first time visitors, which can be great information for Hebron officials, residents and businesses. Read the executive summary of Durham’s first impressions of Hebron by clicking here. Hebron-Executive-Summary-10-18-18-FINAL. The Town of Hebron and its Economic Development Commission hired Peter Fairweather, of Fairweather Consulting, to conduct a Market Study of Hebron’s Business District. Over a number of years, the Town of Hebron has made a commitment to reinvest in Hebron Center to create a successful, dynamic, and walkable Town center. This study takes another step in that process. The work identified potential commercial uses that could be attracted to, or expanded in, Hebron. The study includes an analysis of the existing market potential in Hebron and the surrounding area, and includes a “benchmark” of Hebron against other downtown centers to better understand the strengths and weaknesses of Hebron Center. The final study identifies the types of uses for which Hebron Center has a competitive advantage and an action plan to attract those uses to the Center. The consultant and the Economic Development Commission, through a number of forums, reached out to businesses and other stakeholders to seek their input. 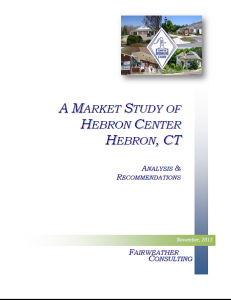 You can read the Hebron Center Market Study here. The Hebron Economic Development Commission, in conjunction with the Town Manager, Town Planner, and Board of Selectmen, helped to create a Tax Abatement Policy which pro-actively encourages new business entities to consider Hebron as their next business location or for existing businesses to further expand their operations in Hebron. Within certain guidelines, considerable advantages may exist for any business to grow within our community. Applications must be made in advance of submitting applications to our Land Use Commissions. The Board of Selectmen has some flexibility in granting abatements on a case by case basis. For a complete copy of the Tax Abatement Policies, feel free to contact the Town Planning Department or the Hebron Economic Development Coordinator at hedc@hebronct.com . Grow Your Health & Wellness Practice In Hebron ! Hebron’s recently completed Market Study identified key business sectors that could best succeed and thrive in Hebron. The Health and Wellness sector was one of these key segments of the economy that was targeted as Hebron has grown into a town of well-educated and health conscious residents where household spending on Medical Care is 71% above the national average. Click here to read about the opportunities to Grow Your Health & Wellness Practice in Hebron. Restaurant and Fine Dining Opportunities in Hebron ! Hebron has many restaurants and dining opportunities for residents and those visiting our Town. Click on the following link to see a map of these restaurants and dining locations and plan your next meal out! Hebron Restaurant Map. Hebron’s Plan of Conservation and Development: The “Community Profile” section of the Plan contains relevant community demographic information. Community Profile: The Connecticut Economic Resource Center produces Community Profiles for each Connecticut town providing an excellent summary of housing, population and employment data. Click here for the 2017 Hebron Community Profile. The Partnership for Strong Communities (PSC) has assembled a comprehensive overview of housing, income, and demographic information for Hebron. The PSC_2018 Housing Profile for_Hebron can be accessed here. Click here for information on loans and potential grants now being offered by the State of CT specifically for small businesses to assist with growing your business!